I have annoyingly inquisitive and very ST Canon educated players who want to know everything to the nth degree including the location of the Shackleton Expanse. I realise that Starbase 364 now Narendra Station is named after Narendra 3 in Klingon space but that area stellar cartography wise is fairly well developed and leaves little room for a huge unexplored expanse. I seem to recall it being noted somewhere that Starbase 364 aka Narendra Station was close to both Romulan and Klingon borders. So based upon this it sounds like the expanse is in federation territory above the klingon empire and behind the Romulan Empire. Does that sound right? Where exact is Narendra Station and the Shackleton Expanse? Okay, so referencing that map (which I believe is the closest thing to canon we have) find Narendra in Klingon space as the "northern" most point near the Romulan border. As you can see, it is very close in proximity to both Federation and Romulan space. 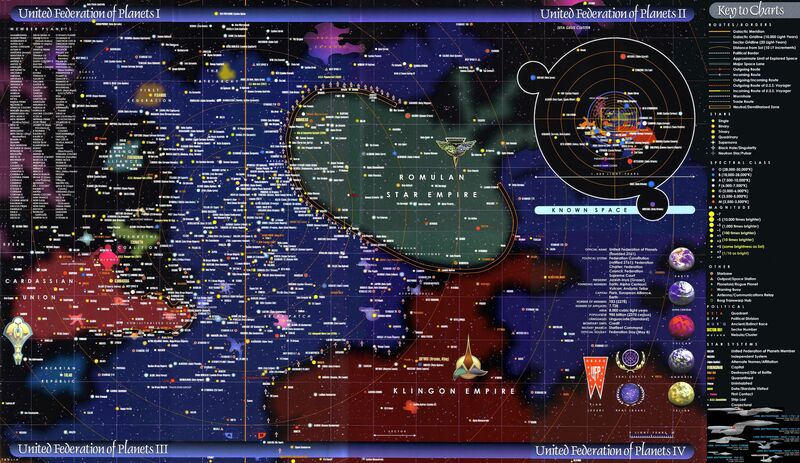 Now, personally, I had no idea UFP space spread that far on the other side of the Empire (into the Beta Quadrant) until seeing this map originally. Modiphius may have decided that is the space in which this game will take place. It could also be further out than that. From reading the flavor text sent to us, I got the impression we were exploring the far side of Klingon space and that Narendra Station (re Starbase 364) was a joint task force base between the Federation and the Empire in orbit of one of their worlds (EDIT - sorry, specifically Narendra III, the site of the Enterprise C/Romulan incident). Also keep in mind that space of course is 3D. I'm not sure there are very accurate depictions of exactly how far "up" or "down" the space on those maps represents - in otherwords, I'm not sure that any borders represented there mean that you couldn't travel "above" or "below" Klingon space to get to the far side of the Empire without ever traveling through the Empire if you catch my drift. As far as I know, Starbase 364 has never existed in canon nor has the Shackleton Expanse. Neither produced any search results on either MemoryAlpha nor MemoryBeta websites. Therefor that'll let Modiphius do more or less what they want with them to create their own canon so long as it is approved by Paramount. I'd imagine that also means you can do more or less what you want with it until Modiphius puts out any piece of story that might contradict you (even then, you can always retcon or ignore). To my knowledge all we have for now is "Very little is known about the area of the galaxy beyond the far borders of space claimed by the Klingon and Romulan Empires. Starfleet has made only a handful of visits to this largely uncharted sector, christened by some nameless stellar cartographer “the Shackleton Expanse” in honor of the famed twentieth-century Earth explorer, Ernest Shackleton." Now combining this with the post above, and the fact that "Narendra Station serves as one more method of enhancing the existing Federation-Empire partnership." It seems likely the Naredra Station is somewhere beyond Starbase 123. How about: It is a playtest not an official campaign so it is somewhere far beyond the Klingon and Romulan Borders. Thats how I read it at least. Going off of Scott's post... I'd place the Station, .